Chinese government seeks development for Xinjiang province but fails to understand the real issues. THE situation in Xinjiang, said a Chinese foreign-ministry official in early July, is “good and stable”. Less than two weeks later, on July 18th, the restive region in China’s far west was again rocked by violence. Officials say police opened fire on separatist rioters in the oasis town of Khotan, killing 14. Two security officers and two people described as civilian hostages were also killed in the clash, the bloodiest in Xinjiang in two years. Recent government efforts to buy calm with dollops of aid do not appear to be working. The incident must have rattled the authorities, both in Xinjiang and in Beijing, 3,200km (1,990 miles) east of Khotan. The previous large outbreak of unrest, an explosion of inter-ethnic violence in July 2009 in Urumqi, the regional capital, left some 200 dead. That shocked the authorities. For months they shut down the internet in Xinjiang, believing that limiting communications would keep a lid on violence. More recently, however, they have been showing signs of renewed confidence after Xinjiang’s Communist Party chief, Wang Lequan, much disliked by Uighurs, was replaced and the internet was switched back on (though still heavily censored). On July 5th, the second anniversary of the Urumqi riots, the new party chief, Zhang Chunxian, like all senior party secretaries a member of China’s ethnic-Han majority, visited a Uighur bazaar where he drank beer, ate kebabs and hailed diners with a cheery “Go Xinjiang!”. Officials in Khotan had been celebrating too, with the launch at the end of June of the remote city’s first passenger-train service. This, they hope, will enable it to cash in on the boom now being enjoyed by Kashgar, 490km along the new line to the north-west. Kashgar has long been a hotbed of Uighur separatism, a problem the authorities have recently been trying to cure with a big campaign to turn it into a trading boom town in the mould of those along China’s coast. Just as prosperity has helped dampen demands in eastern China for political change, officials reckon it can also silence separatism in the west. In Kashgar they speak of the city’s “leapfrog development”. Their model is Shenzhen, the grandfather of Chinese boom towns, on the border with Hong Kong. Kashgar, they say, is to become a trading hub and manufacturing centre that will tap markets in South and Central Asia and even Europe with a web of new roads and railways. Its new “special economic zone” (a concept pioneered by Shenzhen) will produce everything from petrochemicals and cars to halal food, they say. “In the east is Shenzhen, in the west is Kashgar,” is the new official slogan. Yet the gulf between the two is immense. Kashgar prefecture is one of the poorest parts of Xinjiang, which itself is among the poorest of China’s provinces. Shenzhen is China’s richest city. Although he appears more affable than his predecessor, the new party chief is just as tough on separatists. 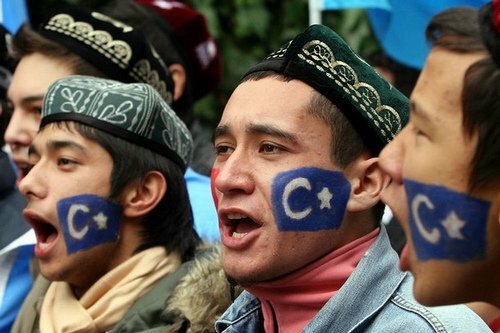 Uighur exiles accuse the local government of tarring any expression of Uighur nationalism with the brush of terrorism. Mr Zhang, like Mr Wang before him, portrays Xinjiang as a target of an al-Qaeda-inspired jihad. For every banner across Kashgar’s streets proclaiming its glorious future, a government poster or wall slogan in the back alleys paints a more troublesome story: injunctions against “illegal religious activities” and unauthorised pilgrimages to Mecca; posters calling on “ethnic separatist leaders, violent terrorist criminals, chiefs of religious extremist forces, serious criminals and suspects on the run” to turn themselves in; and urgings for citizens to report audio or video material containing “reactionary” content. In January Kashgar’s mayor, Maimaitiming Baikeli, said that the government should “gain the initiative by striking the first blow” against separatists. Little evidence backs claims of terrorism linked to al-Qaeda. Violence in Xinjiang shows few hallmarks such as suicide bombings or attacks on civilian targets. Security measures in Kashgar hardly suggest a preoccupation with terrorism, but rather an attempt to keep the population cowed. On February 20th, during calls online for a “jasmine revolution” in Chinese cities, Kashgar police stationed water cannon near the city’s main mosque, while riot police lurked in a government compound. Plainclothes goons routinely follow and harass visiting correspondents. Irresistible. Yet Uighurs worry that any wealth that comes Xinjiang’s way will be grabbed by Han Chinese. Xinjiang’s economy has been growing at double-digit rates, yet Urumqi still erupted with violence in 2009. Unemployed young men from southern Xinjiang, including Kashgar and Khotan, were apparently prominent among the rioters. The authorities accused Xinjiang separatists abroad of stirring up the unrest. But a government researcher says economic factors were “at least half” to blame. Xinjiang Economic Daily, closely controlled by the government, reports that Kashgar’s new zone could create as many as 600,000 jobs, a staggering figure given that only 460,000 people live in the city’s core urban area. The government speaks of training thousands of Uighur peasants to help them transfer to factory work. But the newspaper recommends that soldiers from other parts of China be offered incentives to work in the zone—in effect, continuing a half-century Communist practice of resettling soldiers and other Han Chinese in Xinjiang. The paper suggests that Kashgar’s only college be upgraded to a university and provide subsidised places for students from coastal provinces. It says wealthier cities and provinces directed to funnel aid to Kashgar (Shenzhen and Shanghai among them) should send some of their skilled migrant workers to the city. Officials speak airily of boosting Uighur employment by attracting handicraft industries to Kashgar’s zone—southern Xinjiang is famous for its carpets. But unless new markets can be found, such businesses will have few prospects. The government hopes the new rail line between Kashgar and Khotan will promote tourism. But the experience of Lhasa in neighbouring Tibet suggests they should be careful what they wish for. In Lhasa efforts to attract visitors from the Chinese interior backfired badly when anti-Han rioting broke out in March 2008, triggering upheaval across the Tibetan plateau. The rioting was fuelled by resentment towards an influx of Han Chinese after a railway to Lhasa opened in 2006. Luckily, perhaps, neither Kashgar nor Khotan have the same appeal to Chinese tourists as Lhasa does. A fear of terrorism puts many off. Still, Kashgar is already being transformed by migration, helped by its own first link to the railway network in 1999. It has taken on Lhasa’s appearance of a city divided. Great swathes are the spitting image of any provincial Chinese town, with hardly a Uighur to be seen. In older districts, Han faces are equally rare. In one Han area, a woman hands out leaflets advertising a big luxury-housing project. They are printed entirely in Chinese. Housing could prove a flashpoint. In 2009 the authorities launched a controversial effort to revamp Kashgar’s famous old city, with its labyrinthine alleys of mud-brick houses. Its 200,000 residents are nearly all Uighur. The government said houses would either be rebuilt in a traditional style, but proofed against earthquakes; or, if their occupants agreed, they would be demolished. The government would resettle these people in newly built blocks on the city’s edge. It said the space created in the old city would be used to widen roads and improve access for fire engines. Yet urban renewal programmes anywhere in China stir resentment. In Kashgar they fuel suspicions that the programme is somehow aimed at Uighur culture itself. One Uighur woman says the old city’s residents are not convinced of the need to improve building safety. Allah, she says, will protect against earthquakes. Back in Urumqi the government also hopes that slum clearance will help remove the breeding grounds of ethnic violence. Many Uighurs involved in rioting in 2009 lived in shanty towns. People from these are being moved into new, six-storey buildings. There, many enjoy running water and central heating for the first time. But only those who have lived in Urumqi for at least two years are eligible. In other words, the city is closing down a cheap housing option for the most impoverished new settlers, who often happen to be peasants from the south. This will hardly reduce social tensions. Tang Lijiu of Urumqi’s East-West Economic Research Institute says that creating the right kind of jobs for Uighurs is the key. “Because of their lifestyle, asking them to go into big industrial production, onto the production line: they’re probably not suited to that,” says Mr Tang, who is Han Chinese. Better, he suggests, to develop something like, well, basketball. That, Mr Tang says, might work in the same way that America’s National Basketball Association creates “more job opportunities for blacks”. This kind of musing perhaps helps explain why the vast region of Xinjiang remains perilously unstable.